I Moonflowers nascono nel 1996 ma si delineano come progetto unpublished nel 2005 e dopo le iniziali fasi di avvio, il gruppo comincia ad esibirsi in diversi clubs napoletani accumulando un numero sempre maggiore di live tant'è che il carisma e la forza della band vengono subito apprezzati dal pubblico. Nonostante siano nati come una cover band, i Moonflowers hanno ben presto cominciato a creare un proprio sound, che si riscontra e si distingue sia nelle cover stesse che negli inediti. Nell' aprile 2005 arrivano finalisti alle Audition del CORNETTO FREE MUSIC FESTIVAL presentate da Federico Russo Vj di MTV. Nel settembre 2005 si esibiscono in Piazza del Plebiscito a Napoli in occasione dell' i TIM Tour 2005. In ultimo per ordine cronologico la partecipazione nel 2006 a ROCK TARGATO ITALIA, al Casting di Roxy Bar negli studi di Bologna con il mitico Red Ronnie e scelti come outsider per un posto sul prestigioso palco di AREZZO WAVE. Nell' estate 2006 sono finalisti a Foggia A SPAZIO GIOVANI FESTIVAL Nen novembre 2006 finalisti a Sanremo Rock Nel 2007 Accademia inedita ' Siena' Angeli del Rock Festa europea della musica ' Piazza Dante' Giovani Suoni 'Piazza del Gesù' Pub Awards 2007 a Messina Nel 2008 Primo maggio tutto l'anno e Trimi's festival.Nel 2009 sono vincitori regionali del Primo maggio tutto l'anno. I Moonflowers sono costantemente impegnati alla creazione di brani inediti per la realizzazione del loro primo album. The band “Moonflowers” was founded in 1996 by Anna Balestrieri, the blond singer by the black voice. At the beginning of their carrier a wide experience was made through a long series of live act held in Neapolitan area’s clubs e pubs. Their music is based on a nice mixing of dance and rock “covers” selected by the best songs issued in 70’s, 80’s e 90’s. During their performances the band charisma and power is shown by the ever more enthusiastic response of the different, always increasing audiences. Even though “Moonflowers” was born as a cover band the research for an original sound was immediately expressed through the new arrangement of selected songs and the introduction of their own unpublished works in the repertory. The new look and the definitive character of the band was actualized in 2002 when Anna decided to re fund Moonflowers project after a non positive period. A new energetical and creative wave was taken by the new members who entered the group. Band members Carlo Gardini, versatile, dynamic and “sparkling” bass player. Musical exuberance e gestural expressiveness are the peculiar elements that enable him to colour his stage acts taking to the band his experienced rock background. Vincenzo Raucci, regular, composed and essential keyboard player. His precise vocal support is always well mixed with the main voice giving fluidity e harmony to the sound. Salvatore Pisano, efficacious and polite guitar player, versatile musical finisher. He is able to play a wide variety of sonority well describing all kind of musical scenery the band needs to play. Marcello Melone, well balanced and determined drummer. He is the essential rhythmic base of the band that with his experience and precisiousness gives the right time to Moonflowers sound. Anna Balestrieri, the founder singer, a spirited powerful “soul” timbre voice with “black” tones. A real charismatic and overwhelming stage mistress. The right mix of theory and practice have completed her biting personality. A must see!! Biography Moonflowers have performed so many live acts through the best clubs in Center and South of Italy, during their carrier. They have been invited to several musical and social events and to many local TV shows. They are always involved with new musical projects as the single: “Believe” (it’ s not the way). In 2001 they win “Giovani Proposte” contest of Radio Punto Nuovo. In 2002 they win “Interland” contest as the best band of Neapolitan province. In 2003 they pass provincial and regional selection of GIROFESTIVAL RAI INTERNATIONAL contest being chosen as on of the 16 best Italian bands. They regularly have their evening performances in collaboration with some of the most important radio stations of Center and Southern Italy. In 2005 they were part in “BEFANICENZA”, Radio Marte’s project to collect toys for needy children and had some performances for Radio C.R.C. 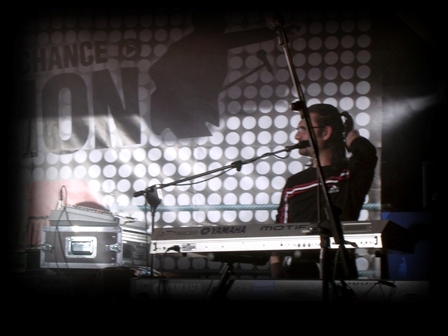 In April 2005 they entered the final Audition of “CORNETTO FREE MUSIC FESTIVAL” presented by MTV ‘s VJ Federico Russo. In September 2005 they perform in Piazza del Plebiscito in Napoli for i TIM Tour 2005 with large success. In 2006 they are at ROCK TARGATO ITALIA, Red Ronnie’s Roxy Bar Casting in Bologna and invited to AREZZO WAVE event as outsider. In August 2006 they are invited to other two important musical events: Super Rock Festival e Spazio Giovani Live Festival (Foggia). Since March 2006 they are on web TV “Night Channel” and on Radio Popolare programme “Liberi Gruppi”. In November 2006 they are at “Sanremo rock” having the 7th place. In April 2007 they are at Accademia Inedita in Siena. Same month they are invited to ‘Angeli del Rock’. In June 2007 ‘Giovani suoni ‘ and Festa della Musica. In 2007 they win ‘Festival Pub’ in Messina. In 2008 Piazza Dante 'Primo maggio tutto l'anno' and 'Trimi's festival'. In 2009 they win 'Primo maggio tutto l'anno'. Since 2006 their songs go through web e FM radios and broadcasted by Sky TV. They are working on new song projects, at the moment.